Fraud. Blackmail. Murder. It's all in a day's work for Eddie Flynn. For years, major New York law firm Harland & Sinton has operated a massive global fraud. The FBI are on to them, but they need witnesses to secure their case. When a major client of the firm, David Child, is arrested for murder, the FBI ask con-artist-turned-lawyer Eddie Flynn to secure Child as his client and force him to testify against the firm. Eddie's not a man to be forced into representing a guilty client, but the FBI have incriminating files on Eddie's wife, Christine, and if Eddie won't play ball, she'll pay the price. When Eddie meets David Child he knows Child is innocent, despite the overwhelming evidence against him. With the FBI putting pressure on him to secure the plea, Eddie must find a way to prove Child's innocence while keeping his wife out of danger - not just from the FBI, but from the firm itself. 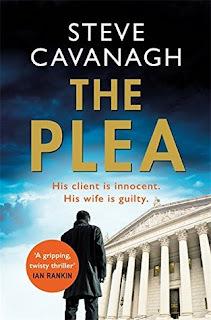 Irish human rights lawyer Steve Cavanagh hit the ground running with his terrific debut, The Defence, which introduced hustler and conman turned criminal lawyer Eddie Flynn. That novel had a pedal-to-the-metal opening with Flynn getting abducted by the Russian mob and having a bomb strapped to his back, with orders to find a way to get it into a New York courthouse to prevent a star witness testifying in a big trial. Cavanagh's sophomore novel has a similarly action-packed opening, as Flynn endures an OK Corral-esque shootout in a prestigious law firm. If you wanted a Hollywood style tagline, try: "Scott Turow meets Lee Child". Cavanagh cements his status as a terrific new voice in legal thriller writing with this sequel; his blend of courtroom twists and high-stakes action shakes up standard tropes and has real freshness. In The Plea, Flynn finds himself at another dangerous crossroads when he is pressured by the FBI to convince David Child, a man charged with murder, to hire him, in order to arm-twist the accused into taking a deal in order to help bring down prestigious New York law firm Harland & Sinton. The Feds claim the firm has been operating a massive global fraud, which is about to boil over. David Child is a major client of Harland & Sinton, who have their hooks in him and are unlikely to let go, as he could threaten their plans. The FBI hoists a sword of Damocles above Flynn’s wife Christine, on staff at the firm, who signed documents as a naïve young attorney that could put her in prison. Then there’s the fact that Flynn starts to believe that Child might be innocent of the murder. But the FBI still wants Child to plead guilty, and is happy to strong-arm Flynn. Cavanagh has a real talent for escalating tension, and Eddie Flynn is a terrific creation well worth following. There are shades of Michael Connelly's Mickey Haller (The Lincoln Lawyer) in his engaging, likable hustler persona, while Flynn is also a unique character all of this own. The Plea is a propulsive read that'll have you soldered to your seat, pages whirring throughout.